When bringing your pet here to Shiloh Veterinary Hospital please make sure to bring any medical records you have. Vaccines and medical history are a big help to our staff when caring for your pet’s needs. It helps the Doctors and technicians know a little about your pet's history so we can further offer the best care for your pet. 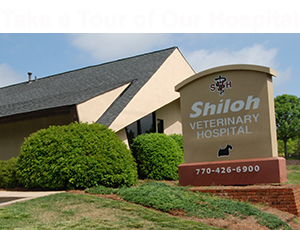 When you come to Shiloh Veterinary Hospital you will be ask to fill out a small form with your Name, Phone Numbers and Address. Plus your pets information. If you have a printer at home please fill out the form below and print it and bring it with you to speed up the registration process. Please have your canine on a leash or your feline in a carrier. This helps to keep your pets and others safe while visiting our hospital.